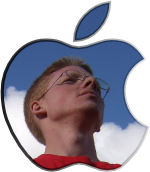 It's official: I'll be an intern at Apple in the Bay Area this summer, working the iPod engineering team. I'm pretty excited about working at Apple and living in Silicon Valley. I got internship offers from Google and Apple in early January, and I've spent the last two weeks thinking about which one I want to take. It hasn't been an easy decision. Google offered me an internship on the Android team working on their new mobile phone platform; Apple offered me a spot working on the iPod. Both were projects that I wanted to work on, and both were at great companies. I wanted to work in Colorado or California, since those are places that I might want to live when I get a full-time job. I wanted to do embedded systems or hardware development since I've never done that type of work professionally. My goal with internships has been to gain broad experience with companies, locations, and types of work so that I'll have a good idea of what I want when I choose a full-time job. It's hard to jump around to different jobs after you graduate, but internships offer a good opportunity to "try before you buy". I waffled back and forth several times in the last two weeks about which offer I wanted to take. The job at Apple offers more experience with embedded systems, but the job at Google was on an exciting new project that I'm really interested in. The iPod is cool, but Android is poised to start a long-needed shakeup of the wireless handset market. Apple is a new company to work for, but I really liked what I saw at Google last summer. In the end, I went with Apple because the type of work there was a little closer to what I was looking for, and because I thought it would be good to see how another company works. I felt bad turning down Google's offer, but I think I made a good choice. I'll miss Google's amazing free food this summer, but I'm excited to work in a fun place on a cool product at a company that's doing amazing things. It should be a fun ride. Nice, Bruce! Yeah, tough decision - I'm excited to hear how you like the Bay Area; I loved it! If you want me to post a 'housing needed' message to the Stanford Wards' email list for you, I'd be happy to.